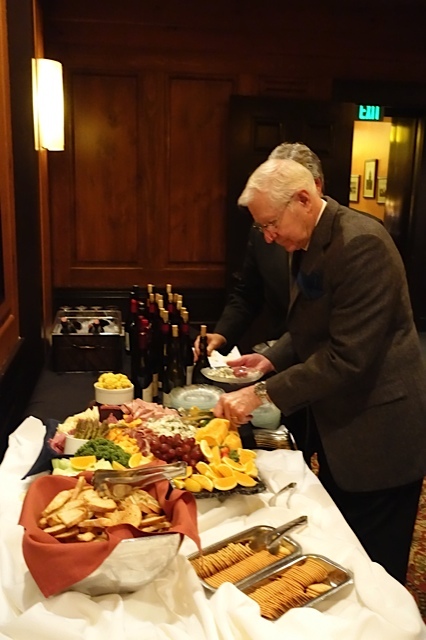 On Tuesday, the 11th of November, the Downtown Rotary Wine Fellowship Group went down to the Madison Club for a wine tasting themed, “From the Saone to the Mediterranean–Wines of Southern France.” 28 Rotarians and guests were present, and they had a great tasting. 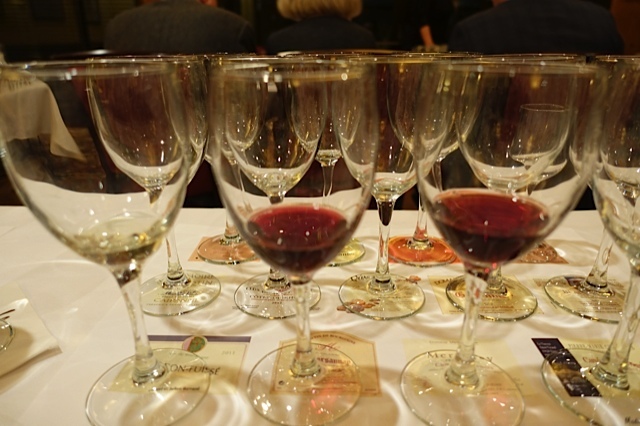 14 glasses were placed on a 20 by 12 inch placemat that had all 14 wine labels reproduced in color, so each wine could be kept in the right place. 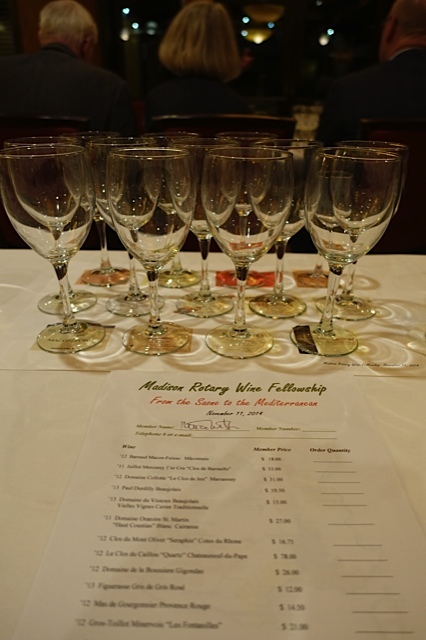 Each taster could be sure which wine they tasted – and no “front and back” confusion occurring as is the case when tasting at the Wilson’s. In addition to the gigantic placemat resplendent with 14 glasses there was a five page description of the wines, with numerous other interesting stories and factoids. A map of France’s wine regions (the focus of the tasting) was provided, and Kitty Bennett noted that if you split this map horizontally about halfway North and South through the country, then those regions above this line usually produced single varietal wines while those below this line usually produced blended varietal’s. This was a fascinating observation. Also provided was an order sheet with the prices of each wine. 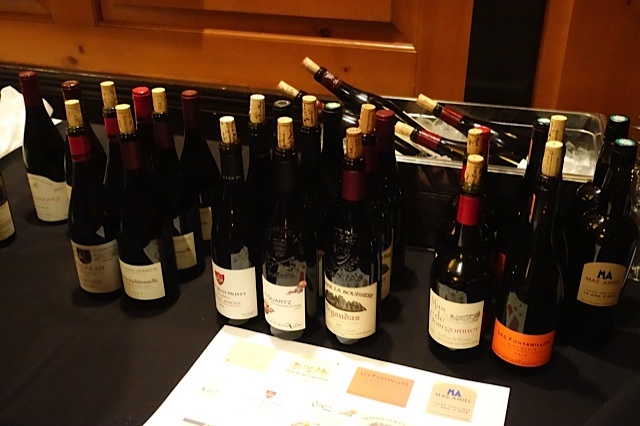 The cheapest wine turned out to be the wine most beloved by the tasting majority, costing $18 to purchase while the most expensive wine was a Chateauneuf-du-Pape (CNP) at $78, a bottle added to the samples by the Madison Club as the “Big Boy” wine of the night. 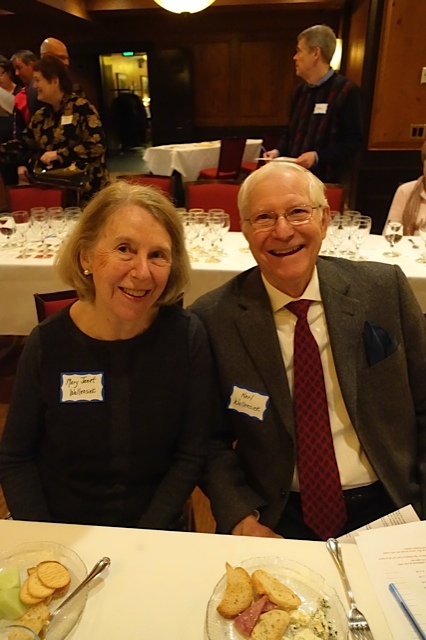 We were all at the Madison Club as the Co-Chair of the Rotary Wine Fellowship group, Steve Mixtacki, had worked with Keith and Juli Baumgartner, regular attendees of both the Rotary and Madison Club wine tasting events, to see if Rotarians could have their own Madison Club tasting. This event resulted from this collaboration. 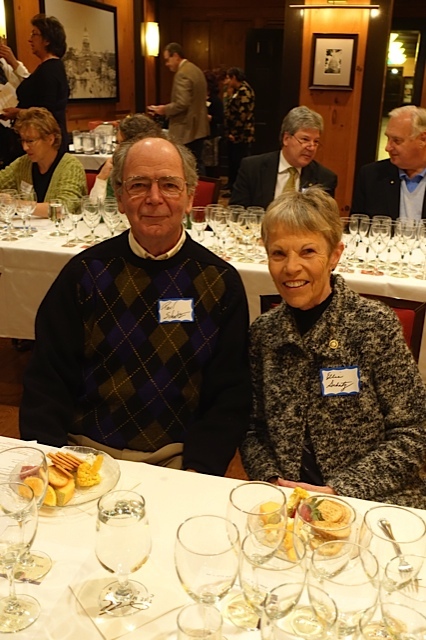 The tasting was managed by Kitty Bennett (pictured at left). 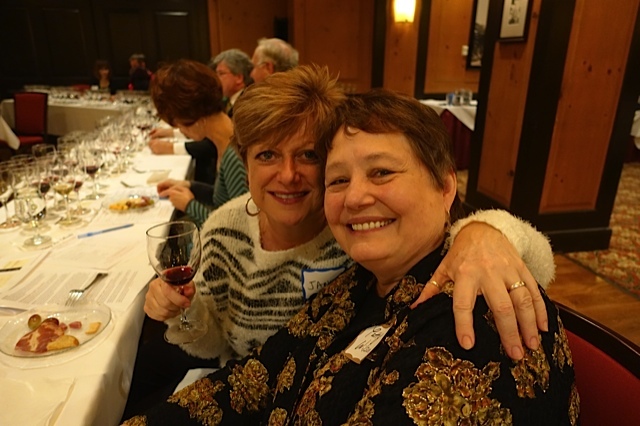 Kitty is the the owner of PRIMA LLC, with a book of outstanding wines. 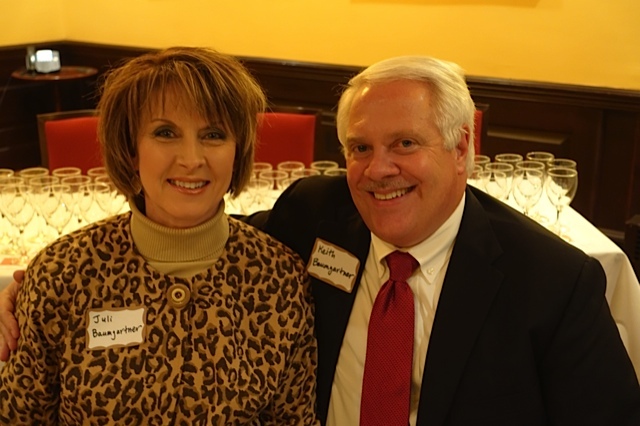 Her portfolio has an emphasis on organically grown wines. 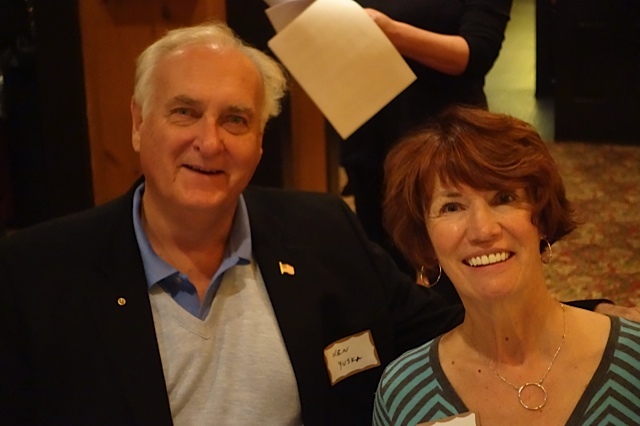 Mike Wilson had worked with Kitty in his Chez Michel days. The first wine set the tone of the evening. This was a Macon white from a great Pouilly Fuisse producer, and this Barraud Macon-Fuisse (a lesser version of Pouilly Fuisse) was a stunner. 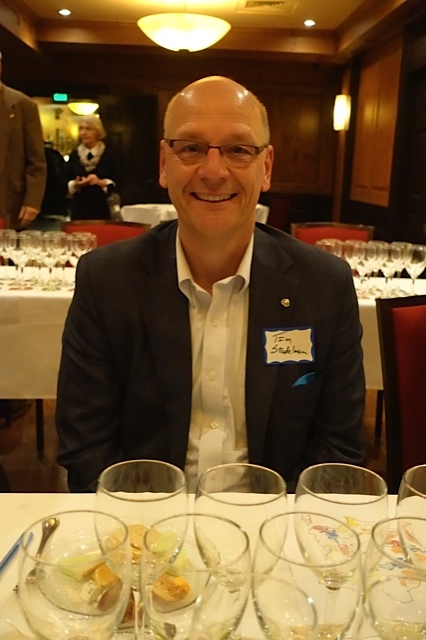 At the end of the evening this was the rated as the “Best of the Bunch” by more than half the tasters – an extraordinary feat for such a large gathering and large number of wines tasted. This wine cost only $18 but reflects the vineyards and winemakers of this superb winery. 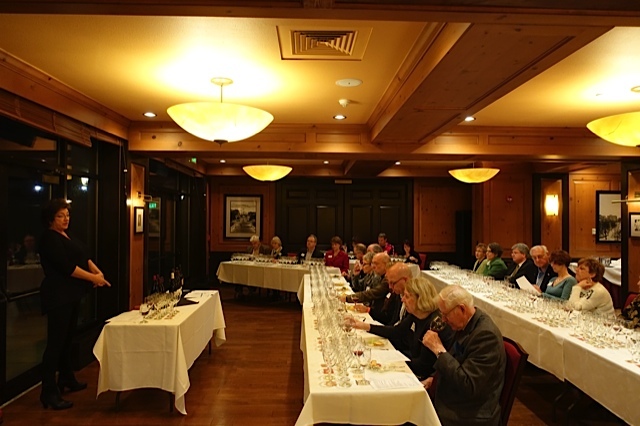 The most expensive wine, the CNP, was rated best by several tasters. Next, two red Burgundies of lesser appellations were tried – a Mercury and a Marsanny, with the latter having a true “burgundian nose”. We then tried two Beaujolais wines, both family run enterprises and classic benchmarks of their style. Now we slipped south into the Rhone. We started with a white (Cairanne) and a Cotes-du-Rhone. Next we tried two other Rhone wines, A Le Clos des Caillon CNP (home of the new French pope) and a Romaine de la Boissiere Gigondas. Both were Rhone blends being south of that “horizontal” line described above. 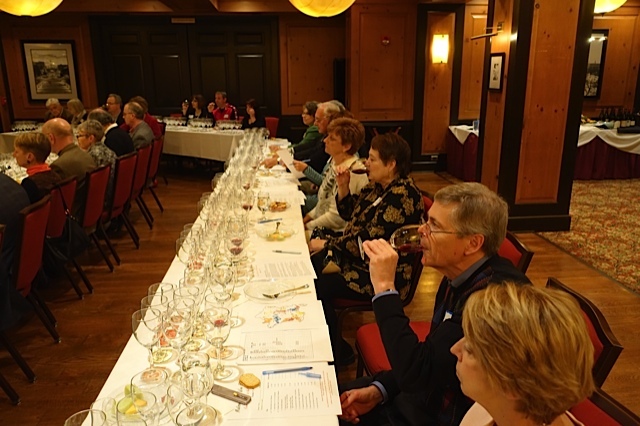 CNP’s are required to have at least 6, and as many as 18, individual wine varieties. The Gigondas we tried had the typical Grenache, Syrah, and Mouvedre combination of this wine, a combination made famous as “GSM” by Australian marketing of their Antipodean blend. We also tried a Rhone Rose. Next, we ventured into Provence and we had a another great Grenache, Syrah, Cabernet Sauvignon, and Carignan blend, and a Minervois made from old vine Grenache, Carignan, and Cinsault. 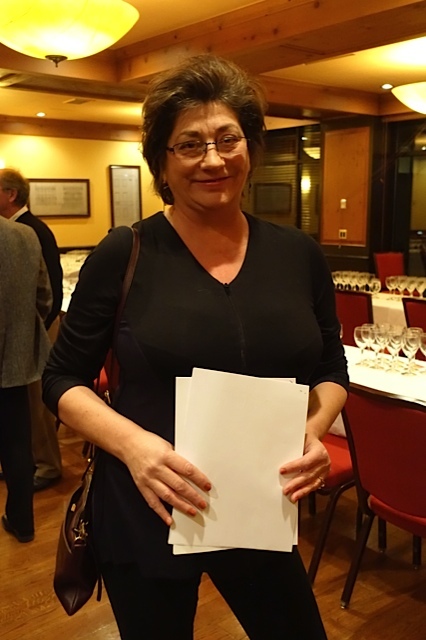 The Minervois had Anne Gros as part of the winemaking, ownership team. Anne is a legend in Burgundy, and as half of this winemaking team, reflects a really serious efforts in place to demonstrate the potential of these regional wines. 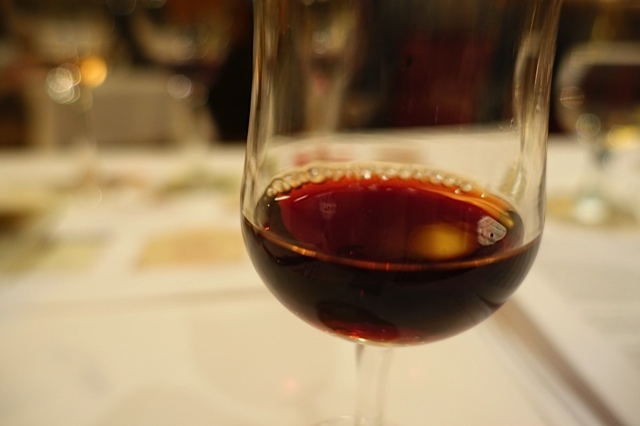 Lastly we had a delightful story of a “sweetie” wine made from Grenache. I loved this 10 year old wine that is aged for a year in a glass demijohn outside – a traditional process that is followed by 6-10 (in this case 9) years aging in large oak casks. The food supplied was excellent, and even included pickled asparagus spears that I could not stop eating. 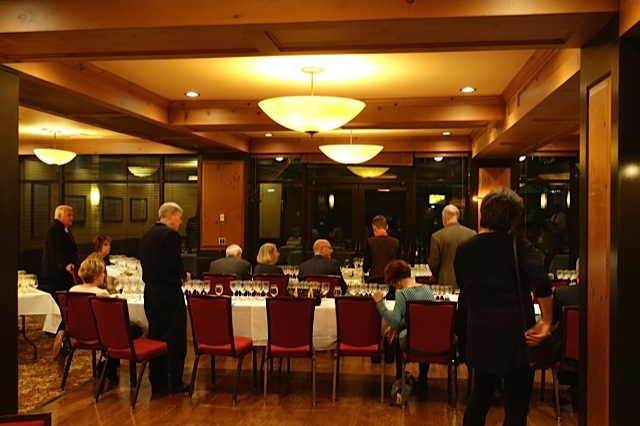 All in all, a wonderful evening was had by Madison Rotary Wine Fellowshippers, and we all thank Steve Mixtacki, the Baumgartners, and the Madison Club for this FINE WINE experience. This entry was posted in 4. 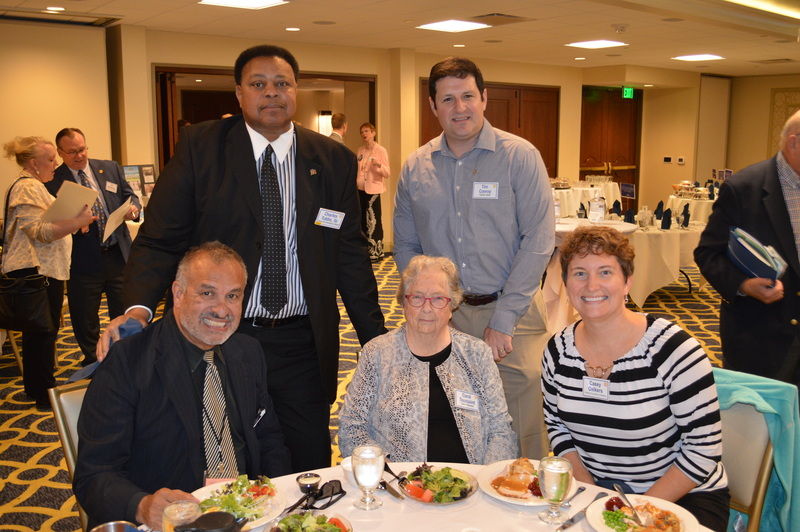 Fellowship Groups, Wine Fellowship, Wine Fellowship Group and tagged Rotary, Rotary Club of Madison, Wine Fellowship Group. Bookmark the permalink.